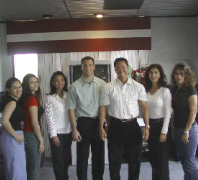 We are a caring, established chiropractic clinic with 2 knowledgeable, caring doctors and an experienced staff. We offer pain relieving treatment for many different types of conditions both acute and chronic in nature. Our "Gentle Touch" form of Chiropractic/massage therapy has healed thousands of patients over the course of over a decade. Because our techniques are so gentle, our treatments are suitable for the elderly and very young. If you were recently involved in an automobile accident or work/sport injury our team is ready to immediately take care of you! SInce you are usually in extreme pain after an accident of any type, it will be comforting to know that our staff will handle all of the insurance paperwork and you can concentrate on the "healing" process. At times, a referral to a qualified attorney may be necessary and our office can refer to a reputable one close to your home.